This thing has sat around for the best part of a year, and I never got through the images that I had indeed so it’s had a bit of a rewrite and is being shoved out into the harsh light of day. It might not work to well therefore, but should be OK. If you have been keeping up with recent research on feathered dinosaurs (or even if you haven’t, this was everywhere for a while) you will know that several teams have published papers describing the colours of the feathers of various dinosaurs. Those with good memories or a strong interest will probably know that Anchiornis was revealed to have been predominantly back (or at least, very dark) with splashes of orange (or reddy colours). However, it would I think be premature to assume that this is necessarily the right, or perhaps better, only answer. What we really know is that one Anchiornis specimen was black and orange at the time it died (assuming there are no taphonomic or other issues). Even people exceptionally unfamiliar with the basics of ecology or ornithology should be able to recognise this potential problem. There are lots of reasons to think that not all Anchiornis were this colour, and not all of the time. At the bare minimum we might expect differences within the species as there will always be some differences in colour and patterning. The morphology of the bones might be identical between different species that were otherwise distinguished by their feather patterns or behaviour (as with the pheasants example I gave recently) that and thus are effectively invisible in the fossil record. There could always be local differences across the range of the species (some might live in forests and others in open areas or have different predators etc.). Far more simply though, it would be a surprise if males and females were truly identical in plumage, if juveniles had the same patterns as adults or if there were no changes over the seasons with moults. In short, the research is exciting and interesting and the wealth of new ‘accurate’ reconstructions of Anchiornis are great. But for this and other feathered dinosaurs, this really not rule out other variations and combinations of colours from being wrong or being suggested. I’d be most surprised if future work didn;t reveal other patterns and colours for other specimens of the same fossil taxon. Equally, I’d be wary of inferring too much from one specimen – the present pattern can;t be used to infer much about the beahviour of the animal when we don’t know if it was male or female, in breeding season or not, in a summer or winter coat or even midway between them. Pretty much everyone in the UK should know this clip, but others may want to enjoy this humorous explanation of perspective. 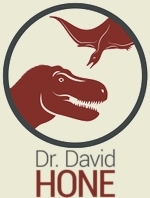 However, while slightly tangential, it does cover the main point I want to make about interpreting both bones and footprints in palaeontology. While many bones have indicators of their ontogenetic status visible, not all do, and of course that’s not true at all of isolated teeth and tracks. Long story short, I’m *really* bored of people assuming that because a bone, tooth or track is small, it must have come from a small species. Small animal yes, small adult, no. A small tyrannosaur tooth does not mean it’s from a dwarf tyrannosaur – it could be from a juvenile, or just be a relatively small tooth in the jaw. Remember to keep things in perspective. So I couple of weeks ago I wrote about the ‘Oriental yeti‘ (itself redundant really) story in the media. What was, and remains, rather obviously a normal mammal (and many people have independently pinned down as most likely being a civet) suffering from mange. I noted that the story was pure hyperbole and built on not only the ignorance of the media spreading the story, but also their apparent refusal to do the obvious thing and actually ask someone who might know what it was. Instead, the opposite was effectively true as the phrase ‘scientists baffled’ did the rounds. They weren’t baffled, they simply weren’t asked. I suggested that once the news broke that it was in fact not interesting at all, it would either be ignored, or the scientists might come in for further criticism for apparently not having got it right immediately. Well, 2 weeks have passed with no word from anyone. It should take only a cursory glance at the real animal to see what it is, and the alleged DNA tests that were to take place should really have been done by now, even if they were no ones’ priority. It was not said which lab said animal was going to be sent to or who would look at it, so it’s hard to find out what happened exactly, but since it is (i rather assume) the job or journalists to find things out as well as report on them, then it doesn’t look like anyone has been trying very hard to follow it up. What I can say is that after a couple of weeks there has been no new news story on the animal since it initially broke. No follow ups have appeared anywhere that I can find. Good ‘ol Google is quite revealing – search for “Oriental Yeti” and you get more than 215 000 hits. Add ‘civet’ to that and you get less than 6000. That’s quite a difference and really illustrates the power of the media to spread misinformation and poor science (however unwittingly or unintentionally). Hundreds of thousands, if not millions or even tens of millions, of people will have seen the story about the baffled scientists and the incredible / bizarre new animal. A few tens of thousand might have heard that it’s just a mangy civet. Even if the media do know by now, they clearly aren’t in any hurry to follow this story up and publicise the fact that they clearly presented something very boring as very interesting, that they didn’t bother to (or apparently even consult) any actual scientists on the subject and had (if somewhat lightly) accused them of not working out what it was in the first place. This of course massively distorts the information going out, but also the distribution of that information. You know, you just *know* that there will be people out there, years or even decades from now, saying “well they never worked out what that Chinese thing was, did they?”. They’ll assume that this has remained a mystery or was something new when it was commonplace. This distorts the scientific process, the work and attitudes of scientists to this work, and paints a very unflattering picture of their abilities. People worked out what this was minutes after the story broke and 2 weeks on there has been no correction, no follow up, no new stories, no (dare i say it?) journalism. And that’s how the media cover science. Great eh? 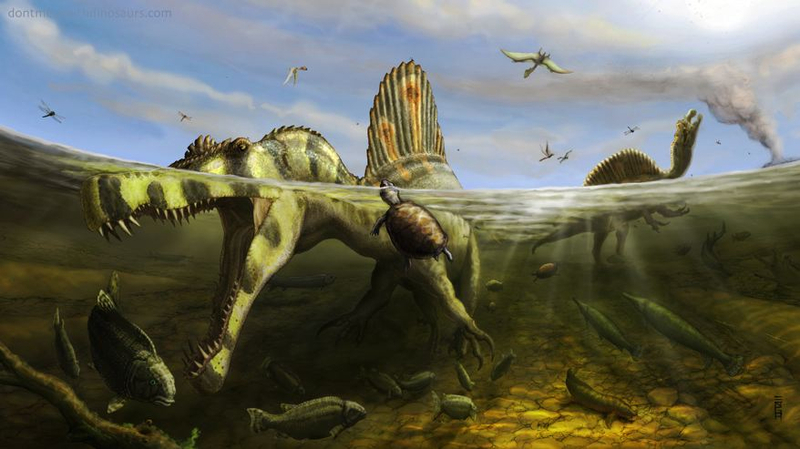 Tor Bertin who can be found blogging here on occasion, sent me this piccie of a pair of Spinosaurus fishing in what is now known as the Kem Kem beds of Morocco. It’s by artist Brian Engh more of whose work is at ‘Don’t mess with dinosaurs‘. Sorry that it’s just another picture post I’m still busy with AAB / blog posters’ block. Obviously Ask A Biologist has sucked up much of my time for the last few days with the relaunch being more successful than I could have hoped. I’ve been inundated with offers of help and the site is overflowing with new questions (almost literally – we have jsut got it down to under 100 unanswered questions). However, two things have struck me that are quite heartwarming as 1) they show how healthy science communciation can be and 2) I can be insufferably smug as they seem to reinforce things I have said before about these issues. Clearly both patterns are influenced by the enormous word of blog campaign that has spread out this time around (thanks again) that went onto many blogs by or for scientifically literate people. Even so, I think the pattern shown here are relevant and likely indicative of wider effects. AAB has always been available to all, even if we specifically tried to direct the site at kids to get them (or keep them) interested in science/ biology. Now however we are seeing a huge flood of questions from people who clearly know their stuff and want to know more. There are very detailed and techncial questions appearing the display an obvious depth of knowledge and understanding of some complex areas of biology. There really is a wide audience out there with a real interest in science who know a lot and want to know more, and presumably either are not being given that information, or at least want extra options and access to more form the researchers. Secondly there are also obviously a large number of scientists both willing and able to engage in science communication but whom have either been stifled in their attempts or perhaps lacked the spark of interest or a platform to do it. It’s noticable how as soon as AAB has reached a wide audience, offers have been pouring in and people have been rolling up their collective sleeves and getting stuck in. It’s great to see. In short then, scientists want to communicate their work to the public and the public want to be communicated to. Why is this proving so difficult? There are many answers to that, but I would argue that AAB has helped brige part of one gap at least and I’m delighted to see both sides taking full advantage. Thanks to everyone who promoted AAB yesterday. We have had well over 100 questions (edit, make than 150! )in the last 24 hours and my inbox is packed with e-mails from potential new experts and general well wishers. Some of the planned (or promised ) in some cases posts have not even appeared yet so more to come I hope. Apologies for any I have missed, but many thanks to (deep breath) Pharyngula, Tetrapod Zoology, Dinochick, Chinleana, Love in the Time of Chasmosaurus, Ethical Palaeontologist, Optimistic Painter, The Open Source Paleontologist, Living the Scientific Life, El Pakozoico, Outside the Interzone, Blog Around the Clock, Art Evolved, Zygoma, Sceptics resource, Genetically Insane, A Natural Evolution, Petersaurus, Teaching with Technology and I think that’s it. Got a question? 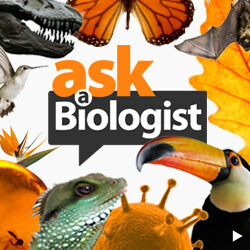 Why not ‘Ask a Biologist’? This went up today on The Times’ online science section and so I’ll shamelessly reproduce it here in a vague attempt to get a bit more interest in the site. Thanks to all of you who have promoted AAB and please continue to do so! I came across this image in my collections today while looking for something else and it seemed too goo not to use. I have commented in the past on bias in the fossil record and how some things go missing regularly from specimens or are not preserved if not made of bone. Well here is a real rarity, a fossil cephalopod. While I really like these animals, I’m not entirely sure if this is a squid or cuttlefish, though I suspect the former. This specimen is on display at the wonderful Jura Museum in Eichstaett and as you can see is (for a soft bodied animal) very well preserved with individual tentacles and more being present. What you can’t see though since there is no scale is that the slab is about 2 meters long – this is a very hefty animal! Not quite Archetiuthus perhaps, but not bad for the Jurassic. 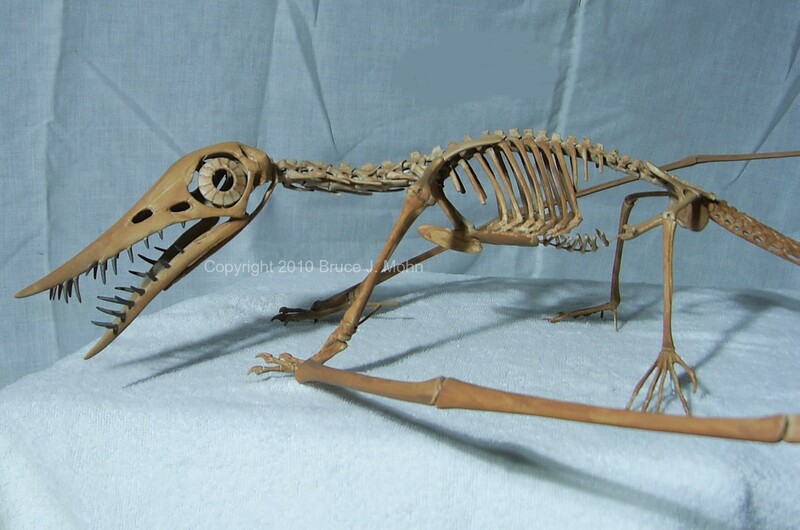 Well I’m still short of posts in general, but Bruce Mohn kindly sent over some images of his Rhamphorhynchus models to put up here. You can see them in a few museums (apparently, since I don’t know which) and even buy them (brucemohn AT aol.com). Bruce works in part for Dino Art too where you can see lots more nice dinosaur related things. More posts to come I hope – still rather suffering from writer’s block, plus the AAB relaunch is understandably taking up time. It’s been quite a while, but the velociraptorine feeding traces paper is finally out. Several of you asked me for PDFs but I didn’t have one before. Send me a reminder / request now and I’ll send it on. For the first time in quite some while I have had close to a break at work whereprojects have cleared up to the point where I have a bit of breathing space in my work schedule. I had intended to fill part of it with some new blog posts but the ohorrible truth is that I’ve rather dried up. I’m nearly out of things I have notes on that could be made into posts and noting at all has occured to me for a while that I could write about. The few things I so have are major projects so will take quite a while to get ready and set up right and will take a lot of time to create and format the figures. In short, the Musings is likely to be quiet in the near future as while I have *time* to write, I don’t have much to write about. I’m out of posts in reserve, out of good images and out of ideas. You’re welcome to leave any thoughts below, but bear in mind that I am lazy and won’t go reading a dozen posts on ornithischian tail mechanics to generate a post on them. I may or may not (and knowing me, probably not, but what the hell) use anything you send, but inspiration may strike. As ever, images welcome too.